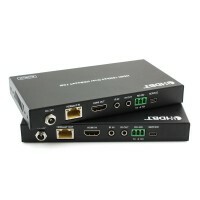 HDMI Extenders provide a great cost effective solution for longer distance HDMI connections. These devices allow the use of standard Network Cable (Cat5e, Cat6 or Cat7) or Coaxial Cable in place of a HDMI Cable. Over longer distances, a HDMI Extender is not only easier to install due to the increased cable flexibility but is also a fantastic way to cut back on overall installation cost. 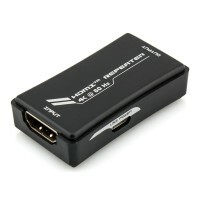 A HDMI Repeater is another solution which effectively increases HDMI transmission distance. This device works by regenerating, amplifying and equalising the incoming HDMI signal. This results in greater transmission distance compared to that which a passive HDMI Cable can provide. This high performance HDMI Extender features an onboard IR (infrared) repeater to allow seamless control of any source device from the remote location. Transmits high definition video and audio, together with IR pass through up to 60m. Foxtel compatible. This HDMI Extender utilises the HDBaseT connectivity standard to transmit high definition video and audio with absolutely no loss of quality up to 70m. This exceptional unit supports resolutions up to 4K (Ultra HD) at 60Hz along with bidirectional IR pass through. This Additional Receiver unit expands upon the 200m Wireless HDMI Extender kit by allowing up to two more receiver units to be added for a total of three display connected simultaneously. Simply plug in the additional units for flawless HD video and audio transmission. This compact unit will supercharge any regular HDMI cable to enable connection distances beyond usual limitations inherent with passive cabling. This repeater will connect inline between two HDMI cables to amplify signal strength. Supports resolutions up to 4K@60Hz.